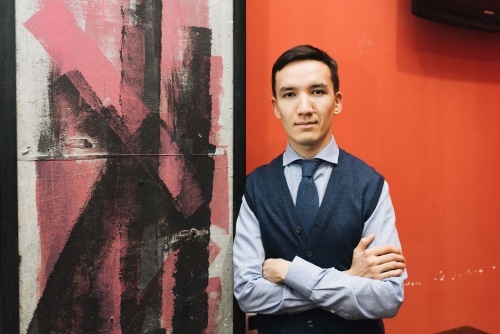 ASTANA – Intelligent Neckties, founded by Kazakh businessman Nursultan Muminov, produces cravats made of wool, flax and cotton that are approximately three times cheaper than imported products. The brand produces more than 13 models. Nursultan Muminov. Photo credit: entrepreneur.sabi.kz. “Our competitors are global brands, but our trick is in our position. We are a brand made in Kazakhstan. We have our own buyers who support production in Kazakhstan. We are competitive in price as well. In quality, our ties are not inferior to foreign ones, but are two to three times cheaper,” he said in an interview with forbes.kz. Muminov devised the idea in 2016 after working in the corporate world that required a business dress code. After finding it difficult to find affordable and high-quality wool and cotton ties, he became interested in producing them locally. “The fact is that I do not wear silk ties. Brand-name ties made of wool or cashmere, for example, cost from 40,000 tenge (US$105). It is expensive, so my wife brought me ties from Europe, where she was studying at that time,” he said. Muminov analysed the market, purchased fabric and hired a tailor using a 300,000 tenge (US$791) personal investment. Initially, production was small and seasonal. “The first sales were mostly to relatives, friends and acquaintances. A maximum 30-40 ties of several models (designs) were sewn at that time and only for certain holidays and dates,” he noted. Muminov paralleled his business with his work. In December 2017, he applied to the Sabi Fund’s Build your Business programme and received a $10,000 grant to develop his concept. “With these funds, in April I went to Italy, found a factory for the production of fabric for neckties and bought it. Before that, I used Korean fabric in Almaty and Astana. I also did a rebranding, created gift wrapping and made agreements with stores in Astana, Almaty and Karaganda,” he said. Intelligent’s ties sell for 12,000 tenge (US$32)-15,000 tenge (US$40). Customers can buy them in stores in the three cities and order them through the brand’s Instagram page (Intelligent_kz). “Many people mistakenly believe that we have a workshop and a warehouse of fabrics and accept orders. This is a finished product of brand-name ties. We want people to buy ties for themselves and foreign guests. Often, there is a problem with a gift such as [considering] a gift for men or guests who came to Kazakhstan. We try to solve it by manufacturing a finished product,” said Muminov.